Iowa’s One Call Law, Iowa Code Chapter 480, defines the obligations and responsibilities of excavators, utilities, and locators. 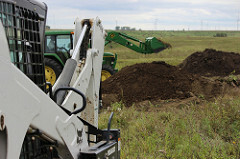 The law requires that excavators, utility operators, and individuals, including homeowners, notify Iowa One Call at least 48 hours before excavating on public and private property, right-of-ways, and easements. The law also requires that underground facility owners and operators mark the location of an underground utility in response to the proper notification of a planned excavation. The Office of the Attorney General vigorously enforces the One Call Law. An enforcement action may range from a warning letter to a civil lawsuit seeking civil penalties and injunctive relief. The Attorney General can pursue civil penalties of up $10,000 per violation, per day, for natural gas and hazardous liquids pipelines. For all other underground facilities, the Attorney General can seek up to $1,000 per violation, up to $20,000 maximum. If a court determines that an excavator who is subject to a previous injunction again violates the One Call law, the court may impose additional fines or even incarceration. This information should help excavators, homeowners, and utility operators avoid damages, and also help protect personal and public safety. Iowa One Call notifications for planned excavations are accepted only through the Iowa One Call Notification Center website at www.iowaonecall.com, or by phone at 811. Excavation notifications are not accepted through the Attorney General's website.